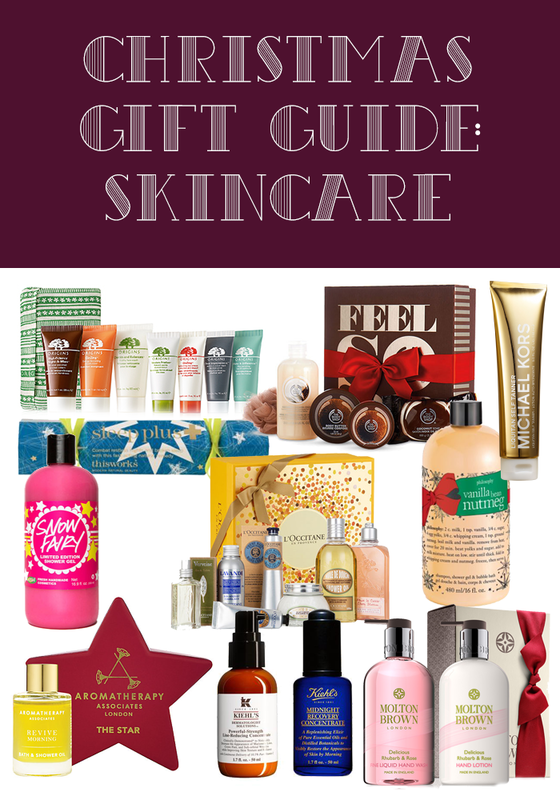 After kicking off with our first set of Christmas Gift Guides, it's now time for a second installment and this time it's all about skincare, bath and body. At this time of the year, Lush is always welcome in my house. While there's so many bath bombs and gift sets to choose from, you really can't go wrong with a good old bottle of Snow Fairy. It's sugary sweet and always a joy to use, just hide it from the men in your household because they seem to enjoy it just as much as we do! Nothing is more indulgent than bath oil, and Aromatherapy Associates know how to make really good bath and shower oils. This cute little star gift is the perfect potion to drop into a bath at Christmas to revive not just the body but the mind, what gift could be better than that? Give the gift of a good night's sleep. Christmas time is wonderful but it can be a little tiring and stressful so this little miniature Sleep Plus spray really helps to send you off to sleep. Having used it myself on many occasions, I've never slept better. Christmas isn't Christmas without a festive Philosophy shower gel and this scent is just delicious! The warm vanilla and nutmeg combination is literally winter in a bottle, but not the usual sickly sweet fragrance you would normally expect at this time of the year this is much more grown up and rich. I love how these shower gels can also be used as shampoo and bubble bath, the perfect multi tasking gift! If in doubt about what to buy someone for Christmas, everyone loves a Body Shop gift set. The only thing you need to worry about is what scent to pick. Personally, I can't get enough of the coconut range and as it's one of their best sellers, it's probably a safe bet too. This has all you need for bath time. This is the easiest and nicest fake tan I have ever used, and would be perfect for more or less anyone...as long as they are okay with a touch of shimmer. The formula applies really easily and dries to leave a non streaky golden tan perfect for paler skins and long lasting, anyone who loves a winter glow would be very pleased with this. When it comes to skincare gift sets, Origins always come out on top. They have a wide range on offer but if you want to give a wide variety of their products to someone special, this is the best one to go for. This set features 7 mini sized versions of some of their best selling products so it's a great introduction to the brand. Not only does this look fantastic sitting at the side of the sink, it also smells DIVINE! This is hands down my favourite scent from Molton Brown, but these handwash and lotion sets come in a variety of scents so you can chose accordingly depending on the person your buying for. This is just a really special indulgent gift that I am sure most people would be happy to receive. If you're going on the fancy/luxurious side of gift giving then this set from L'Occitane is perfect. It features 7 of the best selling products and is sure to make bath time a real treat. Plus for every gift set sold, £10 will be donated to Blind Children UK on your behalf so the gift goes even further. Any skincare geeks your buying for will know how effective and qualitative Kiehl's products are. For a really special treat I don't know of any two better skincare products to gift, pretty much the Beyonce and Jay Z of the skincare world. Both cult favourites that are loved the world over, these will most certainly make you very popular on Christmas morning. We hope you've enjoyed our gift guides so far! Be sure to check in tomorrow for our haircare picks.